HP Process is an entity in the conjunction / disjunction that develops a practice of digital action art and a verbi-voco-visual writing. 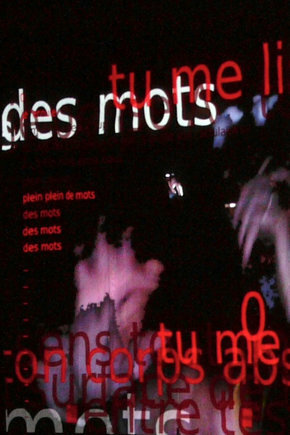 They work primarily with an intermedia poetry performance where image and sound are generated in real time and interactively, in a logic of jamming the different spaces of representation and perception. They attempt to create a poetry in motion and in constant reconfiguration, in which the body text and the letter come to life through an incarnation of sound and gesture. Their work is based on the expansion of sound frequencies starting from the voice in a noise and immersive logic. Improvised as well as read from partitions of poetry, Hortense Gauthier and Philippe Boisnard play with their voice and breath that are digitally amplified and expanded to create an electronic sound poetry, as well as a surrounding and penetrating soundscape. The work of HP Process could be defined as DIGITAL ACTION POETRY. It tries to examine the relationship between body, language and technology, as to explore the plastic, visual, sound, digital and corporal dimensions of writing. HP Process has been invited to a number of festivals, museums and universities like CAPC in Bordeaux, Centre Georges Pompidou, La Comédie in Reims, festival Empreintes numériques (Toulouse), Lab2lab - festival VISION'R (Nantes), festival E-Poetry (Barcelona), festival Son-Vision (Genève), festival VISIONSONIC (Paris), festival de poésie de Lodève, festival Expoésie (Périgueux), festival Les InstantsVideos (Marseille), Cité européenne des Récollets (Paris), FabrikaVoxa - Espace Gantner (Belfort), festival Accès(s) (Pau), Rencontres Chorégraphiques de Carthage (Tunis), PureData Convention 2009 (Sao Paulo-Brésil), Centro Octubre (Valencia-Espagne), International Festival of Art Action (Monza -Italie) and Infr’Action Sète – festival international d’art performance.